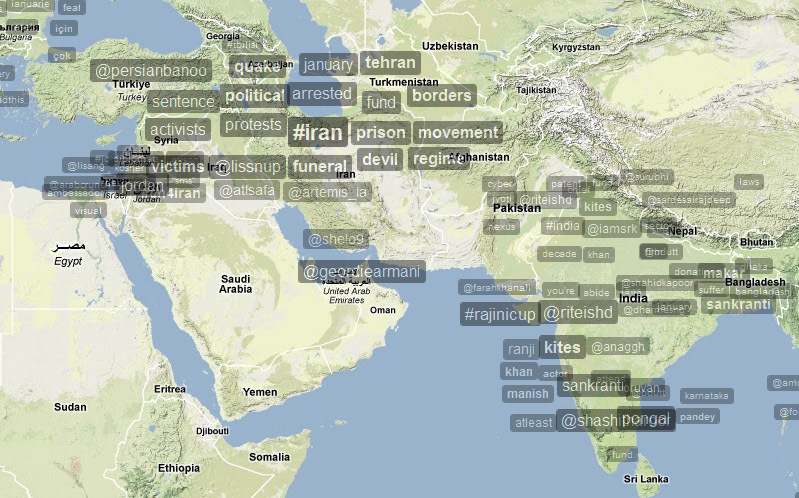 I like to revisit Trendsmap from time to time to see what different parts of the world are tweeting about. Eventually the internet of things will pour tons of data online, and it will all be plotted in real-time, so you’ll really see how the world flows daily — right now we’re limited because the only tweets we get plotted on Trendsmap are probably going to be fairly literate English speakers who can afford to tweet on a cell phone and who care to geolocate accurately. Eventually we’ll have sensors, appliances, robots, etc. automatically tweeting (or uploading to SOME system, at any rate). The implications are awesome. The US should be proud. Clearly sending aid to Haiti after the earthquake is something Americans really care about. 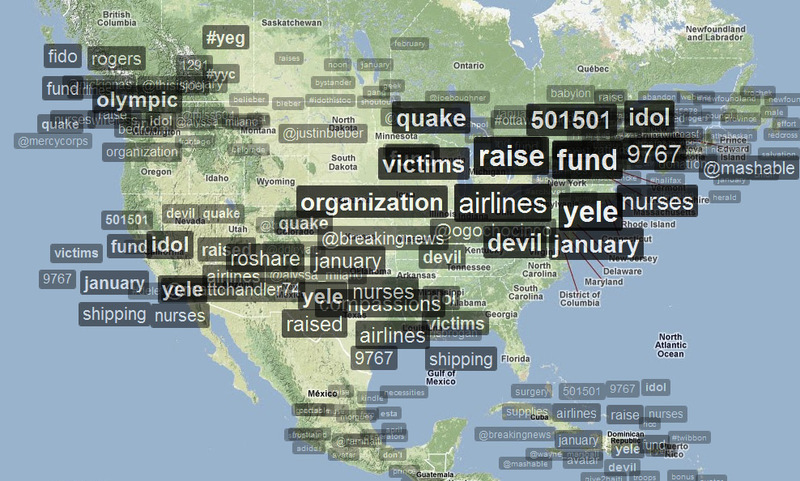 Haiti attention isn’t prominent anywhere else in the world, at least according to Trendsmap. You can see Vancouver is beginning to spool up for the Olympics. Here’s a map of the tweets from Haiti. Hard to say if they’re from the ground or just from people who changed their location on Twitter to Haiti. The numbers are numbers you can text message to to send aid to Haiti recovery organizations. 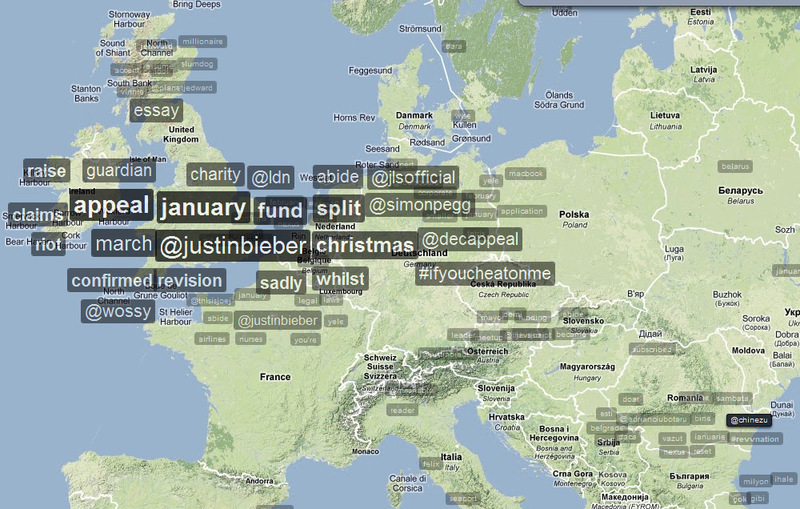 The UK and Europe hardly mention Haiti, and seem to be mixed up in their own daily news flow. Justin Bieber has a YouTube channel. 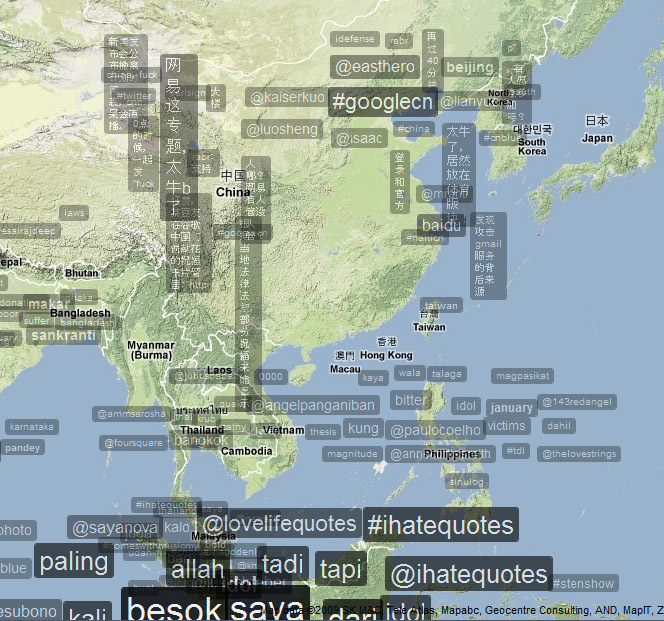 Indonesia LOVES Twitter. Its tweets dwarf the rest of Asia, although you can see some tweets from China, which (I can’t read Chinese) might have some Google news since Google is having a hissyfit with the Chinese government right now. Baidu is Google’s pseudo-competitor/fraudster in China. See any other trends? 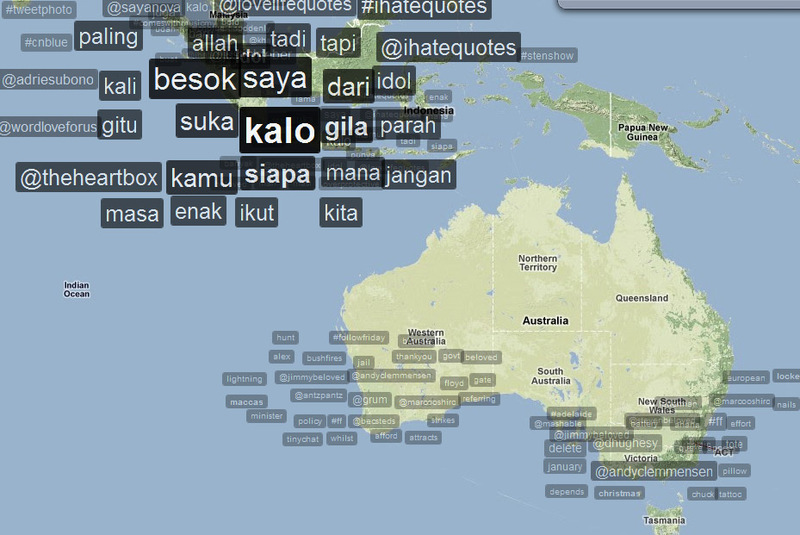 Indonesia, the UK, and US…massive number of tweets according to Trendsmap (i.e. the keywords show up with dark black backgrounds).